Don't forget to visit the Tutton & Young site for travel information to the venue at Canary Wharf and to see the other makers whom you can check out at the show. Keep an eye on our Instagram page for more insights into our progress with the shop! Gabriella Casemore’s jewellery is inspired by her fascination with the repetitive patterns found in flowers as well as vintage textiles. 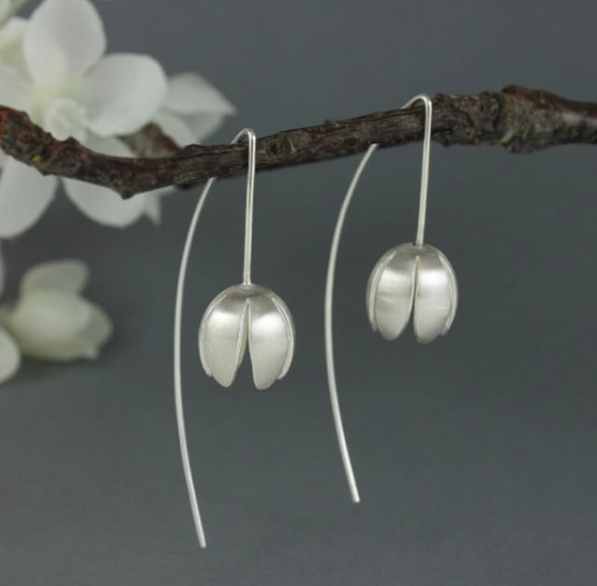 She designs by exploring her ideas with paper first; folding, cutting, layering, then eventually translating these ideas into highly wearable silver jewellery. 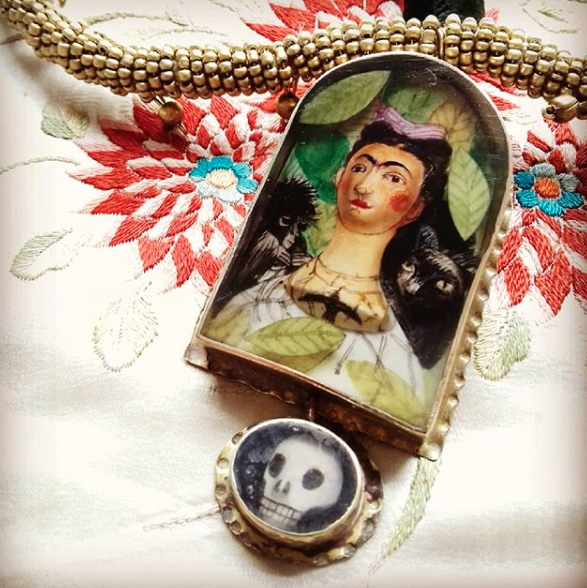 Faye is a multimedia textile designer and jewellery maker based in Yorkshire. Preferring to keep a playful quality to her work, she likes to really push boundaries of material and techniques and is always interested in experimenting with new combinations to create tactile and intricate fabrics. Martin Tomsky creates illustrative, relief pieces from laser cut, stained plywood. These range from very small items of jewellery to much larger, bespoke artworks. Each piece is hand assembled to create an organic object that bridges the gap between craft, illustration and sculpture. Lynne's designs play with light, space and colour, intending to create visual delight for wearer and viewer. She takes an experimental approach with digital tools, exploring and pushing the capabilities of these, using bespoke software tools and 3D printing to materialise complex forms. Combining these tools with meticulous hand finishing techniques, such as dying, polishing and construction, elevates the pieces further. Drawing inspiration from the confectionary industry her jewellery collections aim to glamorise the simple pleasures in life. Having explored the rainbow spectrum of sweet treats from penny chews and lollies in luminous packaging, to cakes and pastries piled with cream, fruit and icing, she has distilled these treats down to their simplest forms, colours and compositions. Iris is inspired by the folkloric spirit of Mexico, it’s naïve identity and vibrant combinations of colour. She is influenced by 1960s graphic design and her jewellery features pattern repetition, people, flora and fauna. Rachel has been making automata, figurative sculptures and jewellery inspired by folklore and fairy tales for almost 20 years. Rachel is influenced by the simple day-to-day objects in our lives and the traditions of the British Isles. Each piece is handcut from decommissioned coins from around the world and comes in its own unique box, individually illustrated by Rachel with the coin’s design, date and origin. MADE Canary Wharf - introducing the ceramicists! We are counting down the days until our pop up at MADE Canary Wharf and to get us started we’d like to share a little about each of the ceramic artists who are showing their work on our pop up stand. You will be able to visit us during the show at East Wintergreen from Thursday 28th - Sunday 31st March, 11-6pm for FREE - plus we are right by the door of the venue so you can’t miss us! Click here for more information about the show and getting there. Follow us on Instagram for up to the minute updates! Tamsin works in wheel-thrown, hand-painted porcelain. The decoration is an exploration of mark-making in embroidery, knitting, textiles and print-making. These influences drive her to work in the simplified lines and marks of thread or block-print. 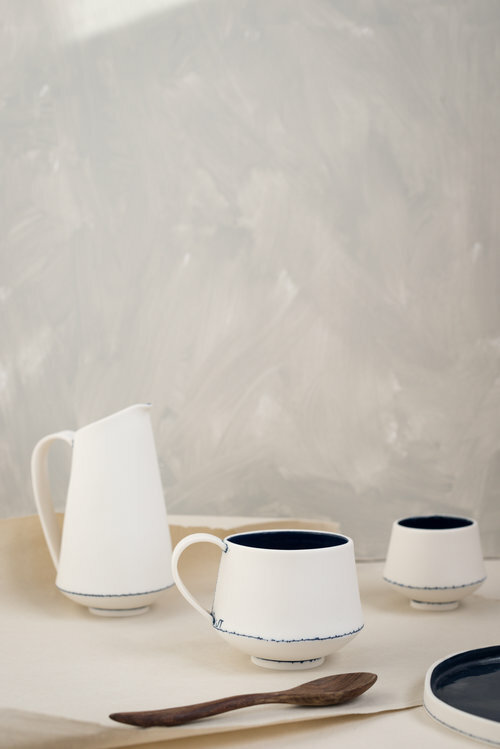 She is drawn to a monochrome colour palette, in particular the blue and white of ‘traditional’ ceramics. Tamsin finds the clean, calm shapes of Japanese ceramics particularly compelling and while she does not consciously emulate them, reflections of these lines appear in her work, providing a contrast to the sometimes intricate patterns applied to the surface. Topsy Jewell makes beautiful, hand thrown pottery with simple, functional designs and strong colours. She uses white stoneware and her own glazes and fires to a high temperature so that her pieces are durable and can go in the dishwasher. Her illustrations are inspired by the natural world, pets, wild flowers, anything that catches her eye. She has always loved pottery that carries a narrative such as Greek pottery, Staffordshire flatbacks and transferware. A passion for both cooking and eating has naturally influence Jessica’s functional response within her designs. She is charmed with the simplistic design of tin and enamelware and aims to encapsulate and reminisce vintage kitchenware through her contemporary designs. Alison’s aesthetic is clean and clear, reducing, simplifying and uncovering underlying patterns. Her overall aim is to humanise the built environment and help people to feel a connection with the places that they live and work in a subtle and very natural way. Yuta Segawa is a Japanese ceramic artist specialising in producing miniature pottery. All miniature pots are thrown individually by hand and he use more than five hundred original glazes he made. It is a challenge to test the limits of what a human body can make on such a small scale. The inspirations for her work come from a wide range of archeological artefacts, everyday objects, the forms in nature as well as materials and processes in ceramics and other crafts. She explores beauty and materiality while obtaining the functions of everyday objects. Silvia’s collections are a contemporary interpretation of simple historical objects with a strong focus on function and colour. While the origins of her early work can be traced to her Slovakian heritage, ongoing research comes from sources as diverse as Spanish pharmacy jars and Iraqi dinner plates. Objects can tell stories - Elaine’s work plays with this sense of narrative through the porcelain, terracotta and mixed media objects she makes and arranges. She creates framed and grouped obejcts that aim to blur the boundaries between the made and the found. Making ambiguous objects that trick the eye, Sophie interrupts culturally embedded values and understandings of ceramics by creating optical illusions through use of colour, texture and negative space. Scott is an illustrator and potter inspired by face jugs from the Southern folk pottery tradition of North Carolina and Georgia, as well as the spectacular sgraffito of North Devon harvest jugs. Come and visit Atelier 51 at MADE Canary Wharf VIP Late Night Shopping! Planning your trip to MADE Canary Wharf? Why not come down for the evening of Thursday 28th March from 6-8.30pm to browse our wares in style and perhaps take advantage of some of the great offers available from exhibiting makers exclusively on the night! More details of the show and travel information, here. Follow us on Instagram for up to the minute news! 2018 draws to a close... Happy New Year for 2019! 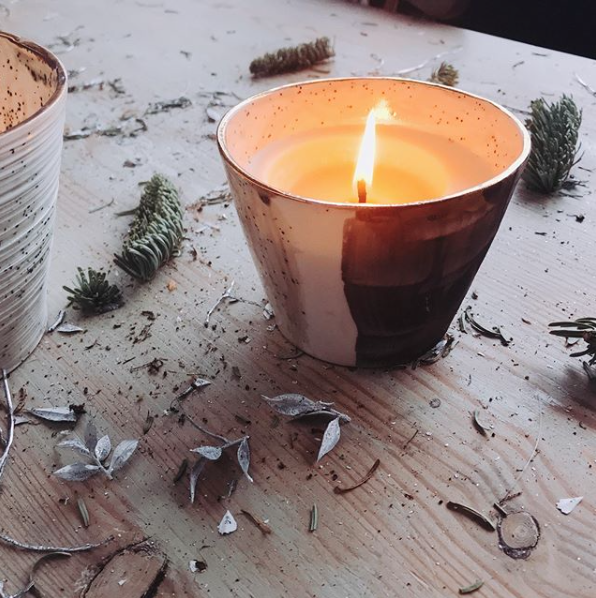 North Laine Late Night Christmas Shopping at Atelier 51 Pop Up! At our Atelier 51 Christmas Pop Up shop, we are hosting a special late night opening in our upstairs Print Room! This is part of the North Laine Late Night Christmas Shopping event, Thursday night, 6th December 6-9pm! Come for a free glass of something nice and a browse and buy of some top notch prints! POP UP SHOP at MADE Marylebone: 2 for 1 ticket offer! 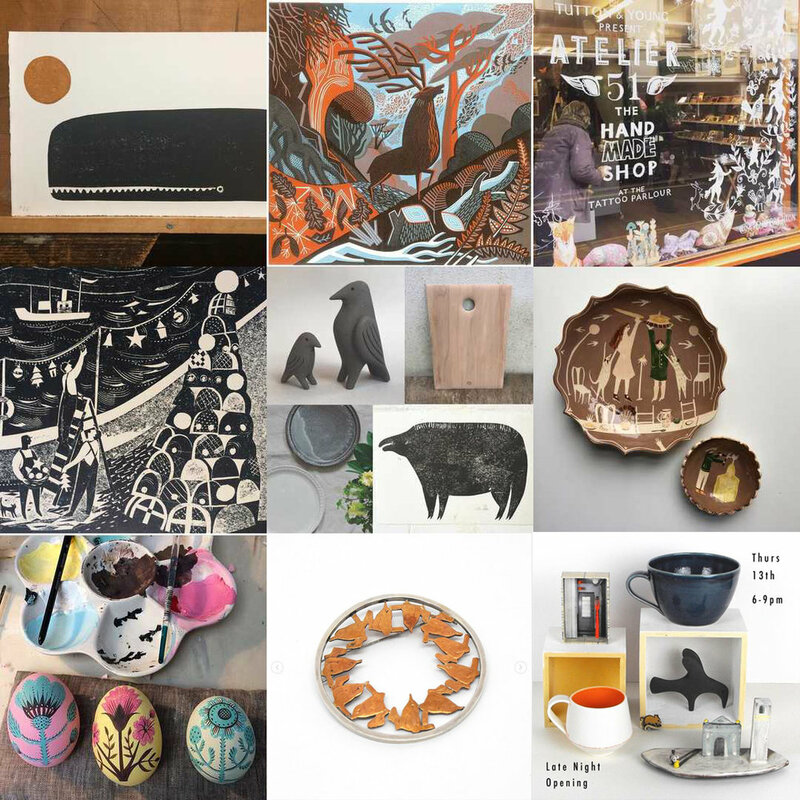 MADE London is the annual opportunity to buy work from over 100 of the most talented, exciting and innovative makers in this country and abroad. The show is on from 18th - 21st October, open everyday from 10.30 - 5pm and is located at One Marylebone, the magnificent John Soane designed church on Marylebone Road, NW1 4AQ. 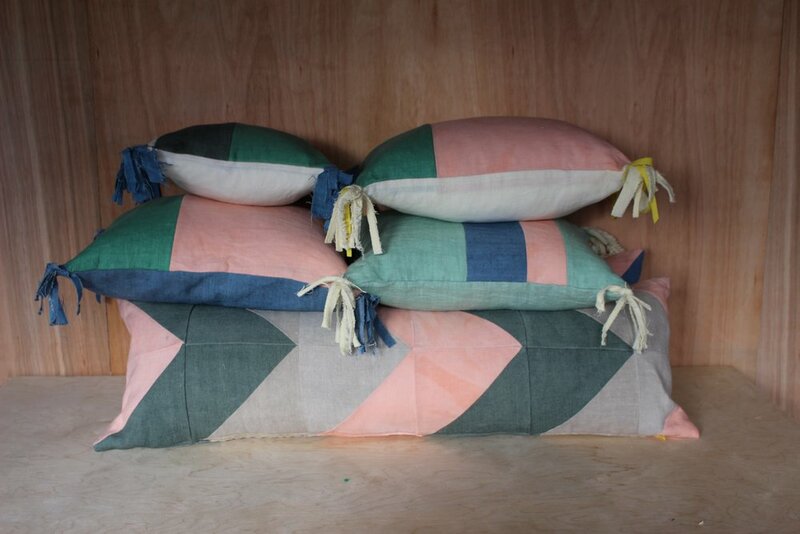 Atelier 51 is bringing a sample of our makers work to this year’s MADE London. You can find our Pop Up shop in the entrance lobby at the show! Simply print off the voucher below and present it at the entrance desk! We are excited to be stocking the work of Deborah Manson - Deborah is a textile artist who loves colour, and is interested in natural sources of coloring and printing fabrics. She enjoys making her work as sustainable as possible by using craft processes and methods such as natural dye, print hand stitch and using fabrics from waste streams. She often looks to mid twentieth century artists and movements for visual inspiration. These cushions first caught my eye when Deborah brought some to Atelier 51 to display alongside Silvia K's ceramics for the Open Studios event. The natural dyes and bold shapes worked so well with the terracotta ceramics and combine dynamic and fresh inspiration with traditional dyeing and patchwork techniques. The pink tone Deborah uses is Madder, a dye derived from roots of the Madder plant which has been used for over 5,000 years and the yellow is Weld, another plant based dye used historically. 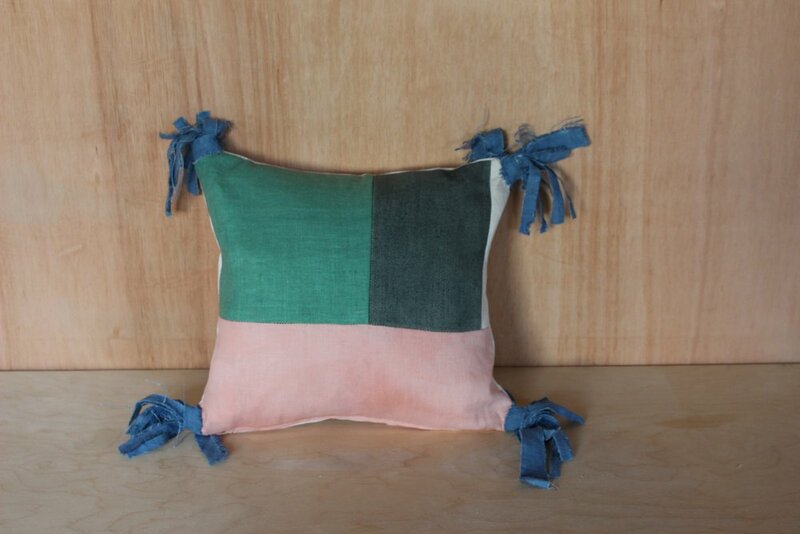 Her work also features repurposed and vintage linen and cotton with feather filling. Browse the whole range in our shop! Ideas for Mothers Day, March 11th! Mother's Day is fast approaching...(Sunday 11th March for those who like me can be unsure!). 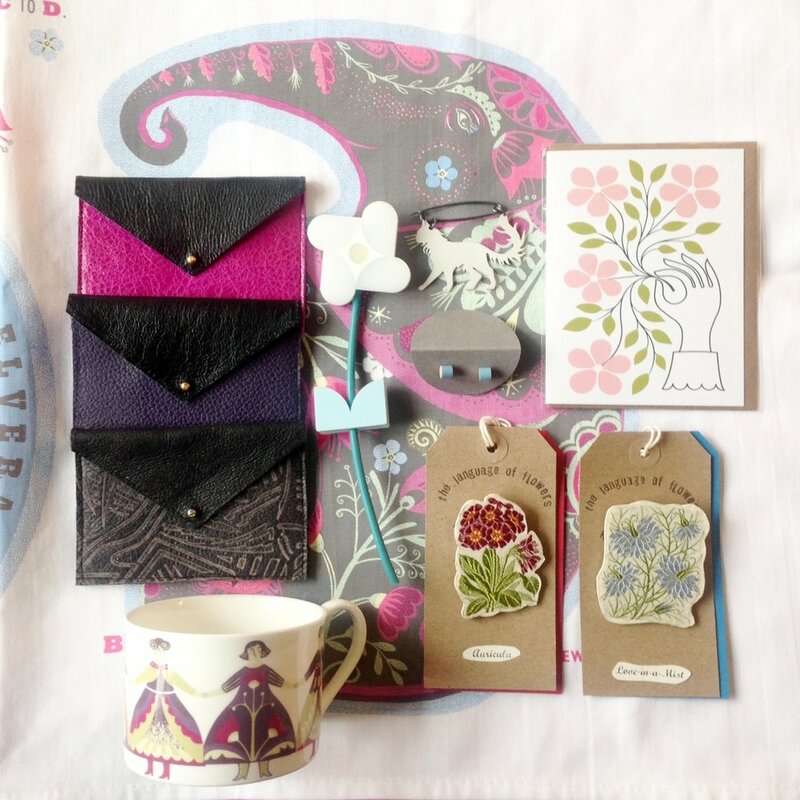 Here at Atelier 51 we thought we would make a list of presents that would be great for your Mum, Grandma or a special lady in your life who needs celebrating! Most of these are £25 or under and are available both in our online shop and in our bricks-and-mortar shop! Come and visit us! When I saw these prints, £25 each by Sarah Young they reminded me of my sister and I - the seasonal settings and personalities are spot on! Perfect present for Mum! See these any many other lovely print options in the shop here on Providence Place in Brighton, open 11-5 Thurs - Sat! New in the online shop, we have a beautiful set of work from Emma Johnson Ceramics! This hand picked selection from the Brighton based ceramicist showcases her brand new glaze colours. If you fancy a saucer with your cup there are several available as a combined and discounted purchase in the shop - just look under the options for each cup design. The pieces are a selection from Emma's Altro-City and Habitual ranges which can be stacked and used together. Atro-city explores the revival of Brutalist architecture, employing classic Brutalist aesthetics like heavy forms and asymmetrical proportions along with design philosophies embodied in the architecture including Form Follows Function and Truth to Materials. Habitual is a collection of simplistic tableware, created for regular use to enhance meal times and become a part of everyday routines. Forms adhere to similar principles as the Atro-City range: heavy and minimal without unnecessary fussy details. These items are entirely handmade, including the wooden riveted handles on the cups which have been individually shaped to fit each cup and riveted to the porcelain. Take a look at the range in our online shop or come and see them in person! After our Open Studios this week, we are "getting away from it all" with our next featured artist - Flora McLachlan. Specialising in etchings and collagraph prints, Flora is inspired by the enchantment of nature. Flora McLachlan's etchings and paintings have an unforgettable presence, infused with a haunting sense of poetry. Her work is carefully structured, where echoes of form build distinctive compositions, enriched by her use of patterns from the natural world. Take a look at more of Flora's work here. Remember, take 15% off at the checkout with the code FLORA and this can also be applied in the real life shop! Online shop - now live! We are excited to announce that our online shop is now live! Browse our range of beautiful handmade wares and order for home delivery. Look out for featured artists and regular product updates. Follow us on Instagram, Twitter and Facebook for the latest shop updates or join our mailing list! We'd like to say a big thank you to all our friends and customers and wish you a Merry Christmas and a very joyful New Year! You can find our latest newsletter here. Sign up to receive our news direct to your inbox!